When and how did a generation of students eagerly absorbing the Harry Potter phenomenon become a force to be reckoned with? The answer lies in in social justice education leadership theory. In short, Albus Dumbledore, the headmaster of the Hogwarts School of Witchcraft and Wizardry, and others like him, cultivated an independent and powerful youth community. As a father figure, leader, and educator for young Harry Potter, Dumbledore became the mentor of an entire youth movement in J.K. Rowling’s universe. But more than that, Dumbledore served as a role model for millions of children in the real world, who make up the Millennials (Palfrey 3), the generation born between the very late 1980s through 2005, during the rapid-pace change of the internet and digital culture. Dumbledore’s influence on the Millennial generation is becoming clear as youth movements like Gay-Straight Alliances storm plazas and demand justice. Dumbledore is an exemplar of social justice leadership by demonstrating extraordinary feats in each of the four tenets of the theory; his example should be followed in training educators and leaders of the future. Harry Potter is a boy wizard whose destiny is to defeat the evil Lord Voldemort. His tale is chronicled in seven novels and several companion books, all written by J.K. Rowling, and adapted into eight blockbuster movies. The real story of Harry Potter is not about wand waving and incantations, but about the power of love, friendship, and justice. In the quest to overcome Lord Voldemort, Dumbledore, Harry, and friends must tackle issues of classism and racism presented by J.K. Rowling as blood-heritage discrimination via “mudbloods,” “purebloods,” “muggles,” and “halfbloods,” (dis)ability, greed, pure hatred, and immense power. For example, the Weasley family is pure-blooded (Sorcerer’s Stone 99), but they are poor (Sorcerer’s Stone 101) and positive toward muggles (Chamber of Secrets 31); therefore, Voldemort and ill-meaning families like the Malfoys look down upon them (Sorcerer’s Stone 108-11). Voldemort is an uncomplicated portrayal of all the evil in the real world, channeled into one figure that children can fight against with their youthful imaginations and rally against as young adults and adults alike later in life. Dumbledore may be a fictional character, but that does not prevent him from functioning as a social justice leader for the Millennials. A social justice leader is a role model, a principal who does not merely preside over the tidings of a school day but also empowers youth. A role model is anyone who is looked to for guidance and is worthy of imitation (Anderson). “In performing his varied tasks as headmaster, Albus Dumbledore is an outstanding role model for those in positions of responsibility,” (Dickerson 366), and the Millennials and new social justice leaders will hold positions of responsibility soon enough. There were many popular culture influences on the Millenials – with the proliferation of the internet, probably more than any in other generation. Well over 325 million books sold worldwide and billions of dollars earned at the box office (Rich) ensure that few Western children fail to identify Harry Potter the boy or the phenomenon. With this kind of impact, denial of the role of Dumbledore as a social justice leader in the minds of the Millennials is hard to find. The Millennials are poised to overwhelm the impression left by youth movements from previous generations. Theoharis and other education leadership theory scholars propose that this increase in youth activist involvement is directly related to the proliferation of social justice leaders. Youth, when guided by social justice leaders, are more likely to prevail over inequality and prejudice. Social justice leadership is a theory originally outlined by Dr. George Theoharis, expanded upon by other scholars, and exemplified by Dumbledore. At the foundation, Theoharis defines these ground-breaking educators as “support[ing] a process built on respect, care, recognition, and empathy” (Social Justice 223). A social justice leader must excel in these seven categories: “acquire broad, reconceptualized [sic] consciousness/knowledge/skill base, possess core leadership traits, advance inclusion, access, and opportunity for all, improve the core learning context – both the teaching and the curriculum, create a climate of belonging, raise student achievement, [and] sustain oneself professionally and personally” (Theoharis, The School Leaders II) Subsequent commentary on Theoharis’ work simplifies these original tenets into four simpler tests: a social justice leader must value and nurture individual strength, place due worth on the power of numbers by building community, and promote and support justice, fairness, and equality, all while intimately intertwined with the school and the community (McKinney and Capper 73, Kose 629) . The development of Dumbledore over the course of the seven Harry Potter novels illustrates that he excels in each category. The first value that any social justice leader must adhere to is the significance of individual strength. These principals must “demand that every child will be successful but collaboratively address the problems of how to achieve that suggestion” (Theoharis, 252). In Harry Potter and the Goblet of Fire, Dumbledore famously bellows, “You fail to recognize that it matters not what someone is born, but what they grow to be!” (708). Consider that Dumbledore was teaching this lesson to the Millennials when they were between 5 and 15 years of age. Dumbledore refuses to believe that some wizards are inherently better because they were born a certain way. Similarly, fighting racism and classism in the real world demands that all people are considered for what they do and not how they were born. But Dumbledore does not merely bellow this to readers, he demonstrates it. Dumbledore looks past what other wizards see as major flaws. For example, Dumbledore places incredible trust in Hagrid, even though Hagrid was both expelled from Hogwarts (Sorcerer’s Stone 39) and born a half-giant (Goblet of Fire 428). Hagrid is charged with both flying the baby Harry Potter to safety after the night of the attack on the Potter family and carrying the Sorcerer’s Stone from Gringrotts to Hogwarts, all within the first one hundred pages of Harry Potter and the Sorcerer’s Stone. Filch, a squib (a person born to a wizarding family with no magic powers) and all-around grumpy man, is faithfully employed by Dumbledore as the Hogwarts castle caretaker (Chamber of Secrets 142). Surely Dumbledore knows that a wizard in the caretaker position could put in much less effort into a tidier castle, but Dumbledore values dedication and hard work. Students at Hogwarts may not like Filch very much, but he takes his position so seriously that he is awake at all hours of the day cleaning up messes, catching students out of bed, and patrolling the halls. In fact, readers have to wonder if Filch ever sleeps. Dumbledore looks past what other wizards see as Filch’s disability, turning Filch’s sheer dedication into his greatest strength. Additionally, Dumbledore even happily agrees to the unprecedented act of paying the house elf Dobby when the elf proposes the idea (Goblet of Fire 379). Essentially, Dumbledore is concerned with the individual. The metaphorical issues of race, class, ability, and achievement that J.K. Rowling constructs in the world of Harry Potter carry little or no importance for Dumbledore. In this way, Dumbledore expresses to youth and adults alike that what society perceives of them is of no matter as long as they are fighting for or doing what is right and good. After all, empowerment is really little more than taking the agency away from society and placing it back into the rightful hands of the individual. Therefore, Dumbledore is empowering youth. This becomes clear in Harry Potter and the Half-Blood Prince, when Dumbledore says, “I am not worried, Harry,’ said Dumbledore, his voice a little stronger despite the freezing water… ‘I am with you,’” (578). Dumbledore was confident that even a wizard as young as Harry could protect him. Dumbledore cast aside all that Harry was – young, inexperienced, and not particularly high-achieving in class – because he believed that Harry was inherently good, therefore, inherently powerful. An entire generation of empowered individuals will dismiss the myth that youth must be the leaders of tomorrow rather than the leaders of today. But Dumbledore is not only interested in the individual; he implores, again and again, that everyone must work together. In Harry Potter and the Goblet of Fire (725), Dumbledore states, “We are only as strong as we are united, as weak as we are divided. Lord Voldemort’s gift for spreading discord and enmity is very great. We can fight it only by showing an equally strong bond of friendship and trust. Differences of habit and language are nothing at all if our aims are identical and our hearts are open.” The four Hogwarts houses, especially Slytherin and Gryffindor, have been rivals for centuries. Dumbledore pushes them to work together regardless. He does not dismiss their rivalry or the reasons for it, but insists that defeating Voldemort is a much greater prize than winning the house cup. This very philosophy is mirrored in the real world Gay-Straight Alliance movement: queer youth are partnering with non-queer youth in their own schools to make the community safer for all teens. Early in the same book, Dumbledore insists that old enemies Sirius Black and Severus Snape make amends: “Time is short, and unless the few of us who know the truth do not stand united, there is no hope for any of us” (712). In these moments, Dumbledore epitomizes what Kose considers a “transformative cultural leader” (639). Kose writes that a social justice leader must develop “trusting relationships with and collective responsibility for each other and all students” (642) and promote “shared norms, values, and dispositions… [despite] unique identity, convictions, and passions” (643). Dumbledore teaches young readers not to forget their differences but to put them aside to stand for what is right; to emphasize their similar goals and the name of progress in the face of past wrongs. This is key in a social justice movement: a variety of backgrounds, privileges, and opinions may differentiate individuals, but they must form a common goal to overcome the challenges they face together. Dumbledore may judge people on their goodness and righteousness, but what is his idea of what is right and good? Dumbledore has a deeply-rooted definition of justice. From toiling with the former evil master-wizard Grindelwald in his youth, Dumbledore learned that justice is ridding the world of oppression, but without sacrificing anyone “for the greater good” (Deathly Hallows 359). In his relationship with Grindelwald, Dumbledore not only associates himself with the premiere evil wizard of his time, he also may have accidentally murdered his younger sister, Arianna (Deathly Hallows 366-67). Dumbledore learns the pain of loss and discrimination first hand, strengthening his ideals of social justice. Dumbledore’s scandalous autobiography by Rita Skeeter and an account of the tale by his brother, Aberforth, both show that the young Dumbledore may have been blinded by power and greed himself. But Dumbledore learned from his past, and changed his ways. When Theoharis writes, “ group of educators have demonstrated success not only with White middle-class and affluent students but also with students from varied racial, socioeconomic, linguistic, ability, and cultural backgrounds,” (Disrupting Injustice 331), he implies the importance of leaving no one behind. The lessons Dumbledore learned from his friendship with Grindelwald form just one example of how Dumbledore shows the rigid dedication to justice that Theoharis demands. In another scene, Dumbledore is quick to admit previous wrongs in the name of progressive thinking: “I seem to remember telling you that I would have to expel you if you broke any more school rules… which goes to show that the best of us must sometimes eat our words,” (Chamber of Secrets 330-31). Dumbledore retracts his threat to expel Ron and Harry not out of a lack of discipline, but because absolutes are rare. Youth learn from Dumbledore that the world is not simply made up of the black and the white, but that adjustments should be made to accommodate events as they occur. By refusing to associate rigorousness and sternness with justice, Dumbledore builds a tolerant community of individuals prepared to adjust to shades of grey. Everyone deserves a second chance. In this case, Dumbledore has determined that sometimes, several chances are necessary. For example, Dumbledore treats Lupin as any other despite his werewolf bite. Lupin says of Dumbledore, “But then Dumbledore became Headmaster, and he was sympathetic… He said that as long as [I] took certain precautions, there was no reason I shouldn’t come to school …” (Prisoner of Azkaban, 353). Lupin, a werewolf, turns out to be the best Defense against the Dark Arts teacher Harry Potter has in his years at Hogwarts. Although werewolves are considered evil in J.K. Rowling’s wizarding world, Dumbledore considered Lupin for his characteristics as a man, not his diagnosis as a werewolf. Hogwarts students benefitted from a year of rigorous and engaging Defense Against the Dark Arts classes. Dumbledore, as any social justice leader should, teaches youth that equality, fairness, and justice are not achieved through rigid laws but by looking at the situation and the people involved: their needs, motivations, concerns, and backgrounds. At the very heart of a strong social justice leader is absolute commitment. A social justice leader blurs the artificial line between “work” and “life,” “becom[ing] intertwined with the life, community, and the soul of the school” (Theoharis 252). This is not to say that these leaders do not take time for themselves, but instead that their mission is ingrained in their whole being. Their work and their sense of self is never separate or distinct. In fact, in Harry Potter and the Sorcerer’s Stone, young readers learn that Dumbledore chose his role as headmaster over the powerful and prestigious position as the Minister of Magic (34-35). To put this decision in perspective, imagine a president-elect of the United States choosing to be a principal in the Harlem Children’s Zone instead of the presidency of the United States. Dumbledore was no less admirable, intelligent, or powerful because of his decision, but he limited his influence to the Hogwarts School rather than the British wizarding world. He choose to become a social justice education leader – he, like Theoharis and other educational theorists, understood the power of the youth. Dumbledore, like all other teachers at Hogwarts, lived at the school. But Dumbledore did not forsake all but his work: he loved woolen socks (Sorcerer’s Stone 214), knitting (Half-Blood Prince 73), and muggle candies (Sorcerer’s Stone 7). That said, Dumbledore understands that his work is far beyond forty hours per week, not because he seeks to overwork himself, but because he cares. Caring for and cultivating students is not a job but a lifestyle. Dumbledore “will only truly have left this school when none here are loyal to me…” (Chamber of Secrets 266). Because Dumbledore dedicated his life to Hogwarts, he was an integral part of the school. He had not only served as headmaster but invested himself in every fiber of the school. Even when he was away, his values, will, and character were always present. The same is true of an educator with social justice at heart. Dumbledore may argue that he is always present in those who are loyal to him, but his chance to prove himself comes when he is murdered in Harry Potter and the Half-Blood Prince. Though Harry and his friends have plenty of allies, the loss of Dumbledore leaves them without their beloved and brilliant social justice leader. Dumbledore’s lessons were immortal even if he himself could not defeat death. For example, as detailed in a later chapter in Harry Potter and the Deathly Hallows, “Dumbledore’s Army” lives on as a source of resistance of Hogwarts students against the oppressive regime of Snape and the Death Eaters (571-88). “Dumbledore’s Army” began as a group of students committed to teaching themselves defensive magic in spite of Professor Umbridge’s censorship, but Dumbledore had nothing to do with the founding of the group. 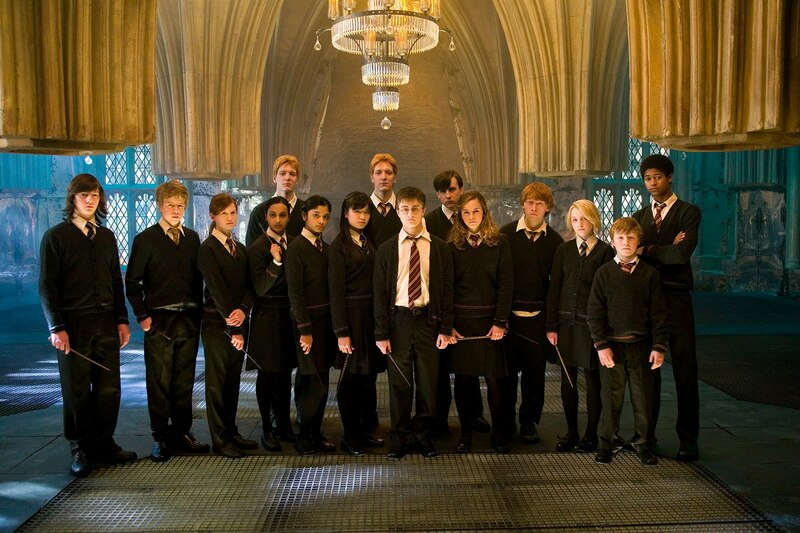 They chose the name “Dumbledore’s Army” because “that’s the ministry’s worst fear,” (Order of the Phoenix 392). That is, the students chose the name “Dumbledore’s Army” because the ministry, which was essentially working on Voldemort’s side by squashing all rumors of the return of evil, was afraid that Dumbledore’s ideas had influenced the students to resist authority. And it did. These students actively fought against Professor Umbridge and sought to prove that Harry was right, that Voldemort had indeed returned to his full power. For this resistance, some students were tortured, and others failed to even return to school, but the spirit of justice survived under the name “Dumbledore’s Army.” Dumbledore’s influence lived on in these students: they refused to be treated wrongly, or to let themselves become a vessel for Voldemort. Through commitment to individual development, community building, justice, and progress, Dumbledore is the perfect portrait of a social justice leader. The Millennials do not have to wait until scholars like McKinney and Capper determine a program for educating future social justice leaders (73); most Millennials are already intimately familiar with Dumbledore. The lessons that Dumbledore bestowed upon Harry and his friends were lessons for an entire generation. Given Dumbledore’s influence, an army of social justice leaders by the side of the youth guarantees a more progressive future full of empowered individuals, tight communities, justice, and dedication. In the moments Harry faces adversity beyond his reach, Dumbledore offers assistance without fail. Even when Dumbledore is long gone, his memory and his strength propel Harry and the rest of the movement against Voldemort. This is Dumbledore’s greatest strength – not his magical prowess, his intellectual competence, or even his calm sense of humor. He is always with Harry, in spirit, inspiration, empowerment, or physical presence. He guided Harry, as he guided the Millennial Generation. Because a generation empowered by social justice leaders sees greater youth involvement in social and political movements, increased consciousness of injustice, and a commitment toward progressive thinking, the commitment to social justice should be at the forefront of education leadership training. The Harry Potter phenomenon has not just come and gone. Through the success of Harry Potter, J.K. Rowling did much more than earn a lot of money. Her character Dumbledore fundamentally shaped the Millennials and encouraged them to accomplish as much as they can. Dumbledore, being so powerful, makes it clear that youth do need social justice leaders, and that workshops and preparation education programs should be providing educators with the tools that Dumbledore has always had: the means to enable youth to fight for their own causes and the causes of others under the unified banner of their own individual strength and their power in numbers. This essay is a call to action. If Dumbledore is able to teach children so much, what can a tangible social justice leader in every school do for the oppressed of the United States? Theoharis and Dumbledore both imply that the answer is social progress, but only by training new educators and principals to empower and inspire youth will the answer ever be found. Sarah Quartey, a sophomore majoring in Urban Studies with a minor in Life Lessons, is interested in rallying for social change, scrapbooking, social justice law, and long nights debating the merits of who-knows-what. She’s dedicated to closing the socioeconomic gap. Brilliant. There’s no doubt that the youth are the most passionate and revolutionary forces of any society. Empowering them and giving them a voice is an investment that every community should make. Great examination of Dumbledore and his significance in approaching social justice!